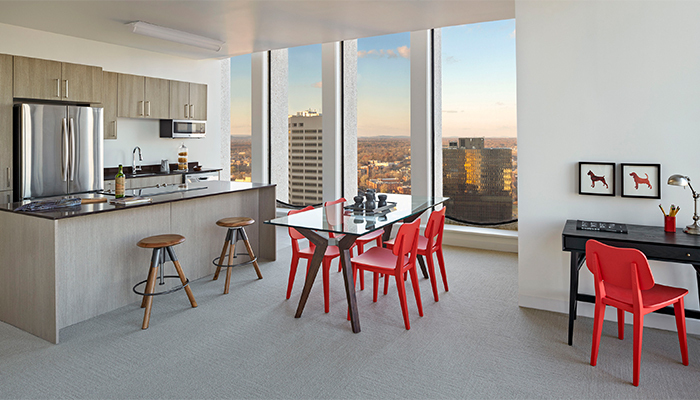 Viking successfully renovated Hartford’s iconic Mid-Century Modern tower for downtown dwelling. Conceived as a model for sustainable development, the community is LEED Platinum ® certified by the U.S. Green Building Council, its highest rating for buildings that are healthier and reduce stress on the environment by being energy and resource-efficient. The 285 studio, one- and two-bedroom units feature 9’ ceilings, open-concept floorplans and chef-quality kitchens. There are 336 Rooftop Solar panels and a 400 kilowatt fuel cell generate clean, combustion-free renewable energy to power and heat the building.